In this Week in Review: Google’s share price surged 10 percent due to growth in search, YouTube and programmatic. Then Israeli start-up AnyClip raised $21 million with Chelsea-owner Roman Abramovich taking part in the round, while Sizmek say the use of Flash resulted in the wastage of five billion mobile impressions. For a weekly summary of industry news and other VAN interviews and videos, sign up to the weekly Video Round-Up. Google saw its revenues grow to $17.7 billion and revenue growth of 11 percent year over year, which has led to the share price rising by 10 percent. In a statement the company say its core search business, particularly mobile, complemented by growth in YouTube and programmatic advertising via its Doubleclick products. Google also has a strong operating cash flow of $7 billion. AnyClip Media has completed a funding round of $21M from investors such as Ervington Investments, representing the interests of Roman Abramovich. Current shareholders Jerusalem Venture Partners, GTI, and other investors also participated in this expansion round. Read full announcement. 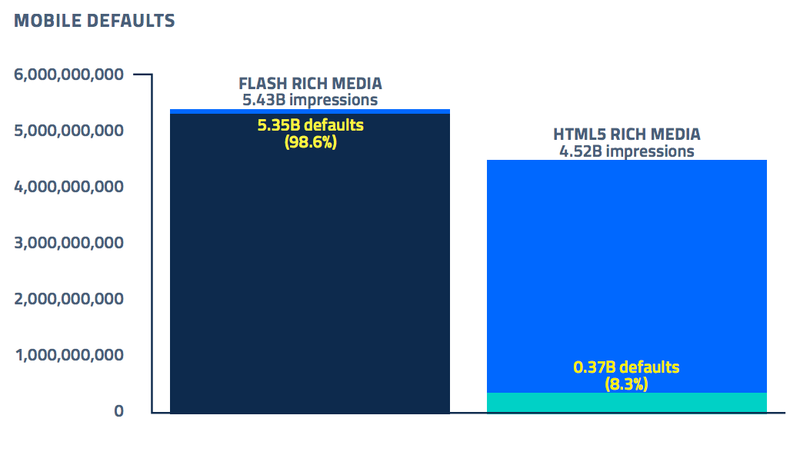 The use of flash-based ads (instead of HTML5) resulted in 5.35 billion rich media ad impressions being wasted in Q1 2015, according to the Sizmek Mobile Index Report. More than 10 percent of advertisers failed to serve a single successful rich media ad to a mobile device in Q1. Video ads on Facebook accounted for 22 percent of total ad spend in June, making it the highest share ever recorded according to data from Nanigans. Mobile video has also been a lucrative sector for Facebook, growth being attributed to gaming advertisers. Video ad completion rate on Apple devices is 78 percent, compared to 50 percent on Android devices, according to research by TubeMogul. 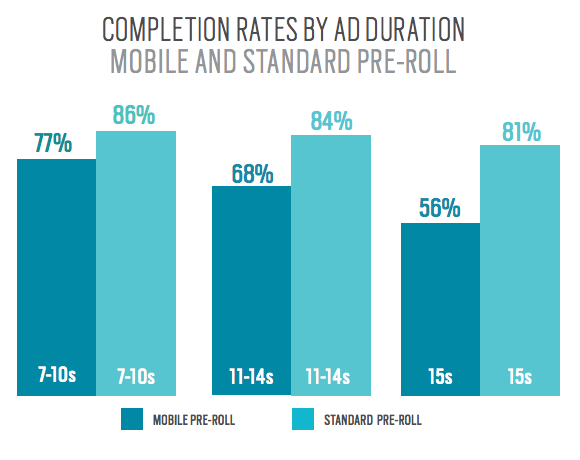 Longer ads are less likely to be viewed to completion on mobile than desktop devices. The MRC looked at viewable impressions for campaigns in the US across data sets from publishers, advertisers and agencies. Where discrepancies in vendor results were found, the MRC attributed 54 percent of inconsistencies to the different ways vendors count viewable impressions on mobile. Verizon will license content from Vice for its upcoming teen mobile video service, expected to launch this year. Nielsen is extending its digital ad measurement to new markets in Asia and Latin America, challenging comScore to become the industry standard as marketers push for holistic measurement. Futuresource Consulting is predicting a boom in Apple Watch, particularly amongst current iPhone users. However, the UK is the exception, despite high iPhone penetration, and traditional enthusiasm for new Apple products, interest for Apple Watch is lowest. This was the week that the WSJ also reported that Apple is looking to sell the iPhone in Iran. YouTube has confirmed that it will launch a subscription based, ad free music service. The service has been beta testing since November 2014. Facebook is testing a personal shopper service nicknamed ‘Moneypenny’ according to The Information. In the UK, 91 percent of Millennials own a smartphone and a high percentage of Millennials in the US and Canada also own a smartphone, according to comScore’s ‘Global Mobile Report’. This is in stark contrast in the 65+ age group, where only 18 percent own a smartphone. OTT video service credential sharing will cost the industry $500 million in direct revenues worldwide in 2015, according to research from Parks Associates. The report, ‘The Cost of Piracy’, analyses US broadband households that use an OTT video service paid by a person living outside of the household and the impact of live-streaming applications such as Meerkat. It doesn’t seem to have troubled Netflix, who announced bumper profits this week. The use of legacy pay-TV services among Netflix Streamers has declined only three points in the last three years, from 87 per cent to 84 per cent, according to research from TDG. At the same time, the use of Netflix streaming among pay-TV users has increased 33 percent, since 2015. In the same week, App Annie found a strong rise in video streaming apps for mobile in Q1 2015. Four motivators are making the mobile gaming experience more compelling. These include daily incentives for accessing the game, incentives for viewing advertisements, daily timeouts and frequent game updates according to a study by Strategy Analytics. The mood of the IPA’s latest Bellwether report on the UK’s advertising industry is ‘mixed’, with overall budgets enjoying a continued boost, during the second quarter of 2015, the survey points to a downturn in optimism surrounding the financial prospects. Viacom18, a joint venture operation in India between Viacom and the Network 18 Group, has announced its new digital business, Viacom18 Digital Ventures (VDV). The 3D box-office is still continuing to grow in China, while 3D’s market share in the US has fallen for the fifth year running according to a report from IHS Media & Technology. Google is testing a feature which will allow users to shop through ads. Called ‘Purchases on Google’, the service will let people using smartphones click on campaigns and visit retailer-branded product pages hosted by Google. Google’s recent effort to prioritise mobile-friendly sites in organic search results means higher costs and fewer clicks for non mobile optimised sites, according to Adobe Digital Index’s Q2 2015 Digital Advertising and Social Intelligence report. The report noted a 10 percent decrease in organic traffic on Google among non optimised sites, as well as a 16 per cent increase in their traffic costs, since the so called ‘Mobilegeddon’. Vindico has received continued accreditation by the Media Rating Council (MRC) for its video ad serving platform and accreditation for its video viewable impression measurement. Videocon d2h has formed a new executive advertising team. The advertising initiative will target inventory opportunities on the Videocon d2h platform. Thailand’s National Broadcasting Telecoms Commission (NBTC) says it is confident that it will have some 39 new digital stations up and running by the end of the year, despite and Thai TV declining to take up its digital licences. Are Custom Creatives the Secret to Engaging Ad-Jaded Consumers?